Prior to the Feb 6 statement by Fred Jennings, that access would remain open, it appears there was discussion about leasing the reservoir for recreational purposes. This is from the Dec 2013 meeting minutes. BCR closing notice spreads, Facebook group perks up. Looks like things are heating up on Cleanup Beaverdam Reservoir’s Facebook page as well as Loudoun Water’s Facebook page. Lets get the word out, the more people that know, the better! It appears Loudoun Water has reversed its decision posted on Feb 6. Water access will be limited to the rowing teams and Loudoun water staff until 2018! Article annouces reservoir access will be closed to the public immediately until 2018. 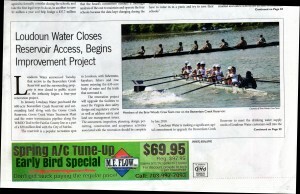 Rowing teams get a pass. Loudoun states it will maintain public access to the reservoir!!! Loudoun Water Purchases Beaverdam Creek Reservoir from Fairfax County. Today Loudoun Water completed the purchase of all Loudoun based water assets from Fairfax, this includes the reservoir, water treatment plant and pipeline along the W&OD. Funding was provided by water rate increase in 2012. Reservoir is opening this Summer! admin on Reservoir is opening this Summer! David on Reservoir is opening this Summer! Josh on Reservoir is opening this Summer! B. Daniel on Reservoir is opening this Summer!